· The effect of case weight variations on annealing is more significant in some brands than others. If weight variations are only located in the case heads, then annealing is unaffected. If a portion of the variation is in the neck and shoulder, then annealing results will vary. Premium brands such as Lapua, Peterson and Norma tend to have small spreads of weight across any given lot. What weight variations do exist tend to be located in the case head, where it doesn’t affect annealing. In other brands tested in this study there is a direct correlation between case weight and annealing results, indicating that at least part of the weight variation in those brands is in the neck and shoulder region. · If weight variation is present in the neck and shoulder, then AZTEC will tend to generate a wider spread of annealing codes if multiple cases are sacrificed. Likewise, annealing those cases will result in a wider spread of neck/shoulder hardness than the premium brands. Many reloaders choose to batch their cases by weight, while others do not believe it is necessary. We cannot comment on downrange accuracy results, but we have studied the effects of variable case weight on annealing quite comprehensively. From analysing thousands of samples, we know that variable case weight can be a factor, but not always. Why would that be so? 1. Does variable case weight result in variable annealing hardness? 2. If so, what is an acceptable tolerance? 3. Are some brands better than others? 4. Where in the case does the weight variation occur? The head, the neck and shoulder, or all over? 5. What is responsible for AZTEC analysis generating different annealing codes for the same brass? Note: In previous studies we have confirmed that case trim length is not a significant factor in either AZTEC generated codes or finished annealing hardness. We have also established long ago that consistent average neck wall thickness is critical. The first part of the AZTEC Analysis process is to insert the correct pilot and enter the correct AZTEC pilot code into the annealer. The pilot code instructs AZTEC as to what type of cartridge it is analysing i.e. 223 Rem., 308 Win. etc. Some pilots accommodate multiple different cartridges. The pilot code suffix (A, B, C etc.) is what distinguishes them for AZTEC. Once a sacrificial case is inserted and "Start” is pressed, AZTEC "Analyse” mode applies a continuous and precise amount of power to the targeted zone of the case until the exact instant that a datum point is reached. In general terms, the longer it takes to reach the datum, the greater the mass of brass in the targeted zone. The capture is extremely accurate and reliable. A patent is pending. By referencing the datum point, AZTEC calculates the correct annealing setting. The calculation, or algorithm, varies from cartridge to cartridge. Extensive laboratory micro-Vickers hardness testing has determined these algorithms. When AZTEC was first released, the annealing codes were not sequential, making them confusing for some users. The AZTEC annealing codes are now linear, meaning that each ascending number delivers incrementally more energy to the case neck and shoulder i.e. 0128 is a fraction more power than 0127. The increments are very fine. These linear codes are what makes the following study possible. Brand "C”: 308W x two lots. Brands "A”, "B” and "C” are widely used. We have chosen not to name them. After fire forming, the first row of 10 cases were run in AZTEC analyse mode to create linear annealing codes for each case, lightest to heaviest. This test was to establish if there was a linear sequence of codes correlated to increasing case weight. Note: Before analysing fire formed cases, ensure that the case mouths are round. If the mouth has been distorted on extraction from the rifle it can affect the code generated. If necessary, necks can be passed over a mandrel to true them before code analysis. Once the best average annealing code was chosen, all 10 of the second row of cases were annealed on that one code setting. This was to establish if annealed hardness increased in a linear fashion as the case weight increased. Each case was hardness tested at three points around the neck, and the average of those readings shown in the right-hand column. We note that the 223R necks were a little harder on average than the 308W. As can be seen, even with very high-quality brass there are still minor variations in hardness for cases out of the same box. A note on virgin brass: If virgin cases are loaded straight out of the box without any sizing, the neck hardness after bullet seating and fire forming, at least in our test rifles, is on average only +15 HV above virgin – not a lot. Surprisingly we have found that these cases tend to under-anneal on the first reloading cycle. It is only after cases have been sized at least once that consistent annealed neck hardness will be achieved reload to reload. This is due to the level of "stored energy” which sizing creates. or simply run virgin cases through a neck die with expander before starting the first load. This will pre-harden the cases sufficiently to ensure the first and every subsequent anneal gives repeatable results. In the following tests, virgin cases were pre-sized as above before loading and fire forming. Our hypothesis for the following tests was that if there is a linear progression of both AZTEC codes and annealed hardness which correlates to case weights, then at least a significant portion of the weight variation must be located in the neck and shoulder region of the cases – the zone targeted for annealing. If there is no linear sequence of codes and annealed hardness, then any weight variation must be located primarily in the case head and is therefore not important for annealing. We started with Brand "B” 308W. These cases were chosen first because they had a large weight spread. The weight spread for these cases was 6.6 Gr. The hardness variation was 9.8 HV, ranging from the lightest case 179.3 Gr. to the heaviest 185.9 Gr. Again, this showed a clear correlation between case weight and annealed hardness. There appears to be no doubt that a significant portion of the weight variation of these cases is located in the targeted neck and shoulder annealing zone. We then tested Brand "C” 308W. These cases had a smaller, but still significant weight spread. These cases had a weight spread of 3.9 Gr. and an AZTEC code spread of 4. The codes showed an upward trend with weight, but not perfectly linear. This showed a very large hardness range of 15.5 HV, ranging from 90 HV to 105.5 HV. The trend was from lightest to heaviest case, but again not completely linear. We believe the results for Brands "B” and "C” tend to show that a significant portion of the case weight variation is located in the neck and shoulder region in these samples. Sorting by weight would be very important in order to decide the correct annealing code, but even then, neck hardness will have a fairly large spread. A further variable is that both Brand "B” and "C” both have fairly erratic neck wall thicknesses. Does neck turning help the annealing accuracy of erratic brass? Weight spread after neck turning was 4.2 Gr. AZTEC code spread was 6. We then annealed the second row of cases using code 0149. Despite removing most of the neck wall variables by neck turning, there was still a large variation of both AZTEC codes and annealed hardnesses. This seems to indicate that significant weight variation still existed in the shoulder and front section of the body of these cases. To check if there were any actual dimensional differences, we sent the lightest case (Case A in the above table) and the heaviest case (Case B) to Andrew Ouwejan at the Metlab Laboratory for longitudinal sectioning. Note that both cases had been lightly neck turned to remove high spots. After turning, both still showed neck wall variations from 0.013” to 0.014”. Note also that because the sectioning process is minutely offset from the diameter, the dimensions below in microns are fractionally larger than when measured in 0.001”s with a ball micrometer. This effect is consistent on both sides of each case. The lower sides of both cases in the photos are reasonably consistent. The upper side of Case B, however, is considerably thicker by some 9.6% from the neck/shoulder junction right back through the body for at least 8mm from the point of the shoulder. This confirms that not only is Case B heavier than Case A in the targeted annealing zone, but also that the weight variation is off center. The annealed hardness variation was just 3.8 HV, or in line with virgin Lapua brass. Again, there was no correlation between case weights and hardness. It is probable that the minor weight variations seen were located in the head of the cases, not the neck and shoulder. The next 308W tests were Norma, the second "premium” brand. Again, case weight variation was minimal at 2.9 Gr. AZTEC codes ranged from 151 to just 153, with no correlation between weight and codes. Annealed hardness variation was excellent at only 2.5 HV, and as with Lapua, showed no correlation to case weight. Comparing these results to "B and "C” tests, firstly, the case weight variations are much lower in Norma and Lapua. Secondly, what variation there is does not appear to be in the neck and shoulder region. It is therefore more likely to be in the head of the cases. Next, we tested Peterson SPR 308W the third "premium” brand. The Peterson cases showed no correlation between weight variability and either AZTEC code generation or annealed hardness, and therefore, as with Norma and Lapua, we conclude that there is no significant weight variation in the targetted neck and shoulder region. They showed excellent consistency. If anything, the annealed hardness case to case was even more consistent than the once fired tests. Average neck hardness was within 1.7 HV of the previous once fired cycle. Weight spread was 2.8 Gr. with a spread of AZTEC codes of just 2. The second row of cases were all annealed using code 0123. These cases generated reasonably consistent AZTEC codes. Despite having a relatively small weight variation, the second set of cases showed a significant annealed hardness variation, trending from lightest to heaviest. However, most of that variation is attributed to one "flier” which was the lightest case in the batch. Apart from that, the results were reasonable, ranging from 93.2 HV to 98.1 HV. Weight spread was just 1 Gr. and AZTEC code spread was 2. All the second row of cases were annealed using code 0138. This shows excellent consistency, both with AZTEC codes and with annealed results, which were comparable in spread to virgin brass. Weight spread was just 0.8 Gr. with an AZTEC code spread of 1. The second row of cases were all annealed using code 0131. As with Lapua, these results show excellent consistency, both in AZTEC codes generated and annealed hardness. There is no correlation between the minor weight variations and either the AZTEC codes or annealed hardness. We believe this indicates that these cases had minimal weight variation in the targetted annealing zone. Returning to the original five questions, we now have some answers. 1. What is responsible for AZTEC analysis generating different annealing codes for the same brass? The above evidence demonstrates that if the mass of brass within the targeted annealing zone varies even fractionally case to case, then a different AZTEC code may be generated. If cases are exactly the same, then the same code will be generated. The Table 4 test of neck turned Brand C 308W cases illustrates that even when neck walls are trued, and case weight is similar, big variations can still occur in both AZTEC codes and annealed hardness if the rest of the target zone, i.e. the shoulder and front section of the body is still inconsistent. 2. Where in the case does the weight variation occur? 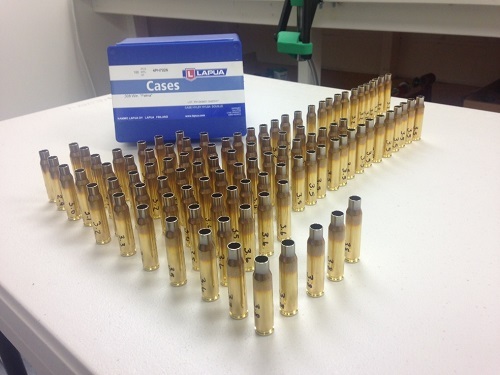 On this evidence, overall case weight variation was minimal in all packs of Lapua, Peterson and Norma cases. What variation there was did not affect either the AZTEC code generation or annealed hardness. Therefore, any weight variations with those cases must be in the case heads. Brands "A”, "B” and "C” showed clear evidence that at least a portion of the case weight variation was in the targeted annealing zone. This may have implications beyond the scope of this study, in particular variable case volume. 3. Does variable case weight result in variable annealing hardness? - That depends on the cases. With all three brands "A”, "B” and "C”, we saw a considerable increase in annealed hardness as case weight increased. The Lapua, Peterson and Norma cases showed no such trend. 4. If so, what is an acceptable tolerance? – That depends on the reloader's expectations. The lowest single hardness reading in all the above tables is 85.2 HV. That is not low enough to ruin that case, and when shot and resized, it would regain hardness. The highest single reading is 106.4 HV, which is still definitely annealed. For the reloader who just wants to extend the life of their cases, that sort of tolerance may be acceptable. Neck tension, however, would not be very consistent. For the competitive shooter, in particular at long range, the tighter the HV tolerance the more consistent the neck tension (and hence velocity SD/ES) will tend to be. 5. Are some brands better than others? The above tests show results for two boxes of Lapua (223R and 308W), two of Norma, one of Peterson, one of "Brand A” one of "Brand B” and two of "Brand C”. We cannot say for sure that every box of Lapua, Peterson or Norma will be as good as those tested here, nor that brands "A”, "B” and "C” will always be that erratic. On the above evidence however, batching cases by weight would show greatest benefit with brands "A”, "B” and "C”. It would appear to be less important for Lapua, Peterson or Norma, all of which showed excellent consistency. Note that all cases tested in this study were fireformed once from virgin brass. We strongly recommend that sacrificial cases are analysed at the fireformed, unsized stage. That is when annealing should normally be done. Depending on the rifle chamber specification, unsized cases will usually generate an AZTEC linear code lower than sized cases. We used stock standard Remington 700 rifles for both the 223R and 308W tests. Fireformed AZTEC linear codes were consistently 2 lower than sized or virgin cases. Note: the other major factor in accurate annealing is neck wall consistency. Neck wall thicknesses should be checked before even starting to weigh cases. Each 0.001” will make a significant difference, as can be seen in our Standard program listings. Recap on selecting sacrificial cases. Not many reloaders would want to sacrifice ten cases, as we did in each of these tests, in order to establish the correct AZTEC linear code. That is why we have highlighted the importance of weight sorting cases. While this study shows that weight sorting is less important with Lapua, Peterson or Norma brass, we cannot rule out that some lots of those brands might be less uniform than those we tested. For the sake of a little extra effort we think it is best practice to weigh all new batches of brass. Once the most representative median weight is established, one or more sacrificial cases can be analysed. As noted above, ensure that case mouths are round before sacrifice. If several median cases are sacrificed, they should be within +/- 1 code of each other. The increments between codes are very fine, and that range will give correct annealing. Having gone to this effort, make sure to keep your case lots separate. If lot numbers get mixed it can be almost impossible to re-sort them. We would like to thank Donald Eigler for his advice and editing assistance.